Alita: Battle Angel review: "Treads an awkward line between gritty and absurd"
Impressive VFX and bursts of action can’t mask the fact that this is a tonally confused start for a sci-fi franchise hopeful, made up of scrap parts you’ve seen put to better use elsewhere. James Cameron has been trying to get cyberpunk manga Battle Angel Alita onto the big screen for the best part of two decades. Being sidetracked by the Avatar industry, he passed the reins on to Robert Rodriguez, while still seemingly retaining a very hands-on producer role. It certainly feels more in Cameron’s wheelhouse than Rodriguez’s: epic, post-apocalyptic sci-fi, told using ambitious, boundary-straining VFX. But like the titular character, the film is a visually impressive technical marvel that lacks substance under its glossy shell. Alita (Rosa Salazar), as she’ll come to be named, is discovered by cyborg doctor Dyson Ido (Christoph Waltz) when he’s scavenging Iron City’s scrapheap for spare parts. He takes her intact cyborg core (with a still-functioning, albeit amnesiac brain) and gives it a body. 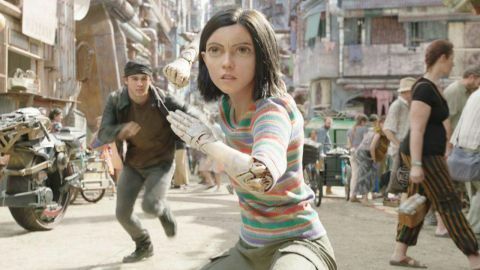 Like a dystopian Geppetto, he’s delighted to see his creation blink to life, and at first you can somewhat relate: there’s no denying that Alita represents a remarkable piece of digital rendering, with alien-proportioned eyes and an ornate exoskeleton. But even so, Alita still doesn’t entirely evade the uncanny valley effect, with some of her facial nuances not ringing true. This wouldn’t be as much of a problem for a supporting character, but is a more troublesome proposition for a protagonist with a movie resting on her emotional arc. To Salazar’s credit there’s something likeable and determined about Alita, but the CGI puts an emotional forcefield around her. Emerging into Iron City with wide-eyed (even by her own standards) enthusiasm, Alita meets and falls for Hugo (Keean Johnson), a local boy looking to escape the earthly doldrums for a place in Zalem, the floating utopian city that hovers above. Also on the periphery is Vector (Mahershala Ali), who trades cyborg players for a brutal sport called Motorball, which is like a cross between speedway racing and Robot Wars. On rollerskates. Plus, there’s danger lurking on almost every dark corner in the form of Hunter Warriors, man-machine hybrids chasing bounties for credits. There’s no doubting the tactile quality of the environment. Sets and CGI combine harmoniously, and the mechanically augmented humans are similarly seamless. The problem is Alita: Battle Angel doesn’t nail the storytelling and character elements required to get you actually invested in this dusty world. The players never feel much more than ciphers, with the talented cast often saddled with a clunky dialogue. Nothing’s ever hinted at when there’s on-the-nose expository dialogue to be delivered instead. “It’s a harsh world,” Hugo tells Alita, as Zalem literally dumps its garbage on Iron City. She lacks memories, not common sense. Given the lead character’s optical affluence, Cameron and co-writer Laeta Kalogridis could’ve trusted their audience to use their peepers a bit more. There’s a couple of well-staged dust-ups, and an impressively breakneck Motorball set-piece to enliven the pace, but these are fleeting distractions in a story that’s otherwise hard to care about. It also treads an awkward line between gritty and absurd. This is a grim, frequently violent world, but it’s also very, very silly, and Rodriguez might have fared better had he pushed it further in one direction or the other. Only Ali gets to have some fun, as a baddie who’s the mouthpiece for a bigger, off-screen villain. From the cyborg aggressors that look like overdesigned video game bosses (led by an unrecognisable Jackie Earle Haley), to the ripe dialogue and not particularly compelling romance, there are frequent unintentional laughs. Throw in a few distracting cameos, and the result is an extremely bizarre mishmash that seems desperate to set itself up for a sequel, even though it’s hard to imagine anyone wanting to spend much more time in this world.